Fashion, Classic, Trendy & Unique. All sets are one of a kind. Made from Black Oak Acorns capped & uncapped. Fancy & multi colored glass beads, mother of pearl shell pearls, glass pearls, gemstone beads & crystal beads. Each set is different as the black oak acorns are the vocal point of each set. I use sterling & 14K gold plated findings of the best quality. Fish hooks on the earrings & a very easy use clasp. I can also make clip ons. If you want a custom set done and see beads you like but want a different configuration just let me know. There is no extra charge for a custom piece. If you have any questions please feel free to email me at any time. As these black oak acorns come from my own trees I also carry an assortment of "Acorn Beads" & "Bead Caps" for creating your own goodies and they are listed in the goodie section. I will be adding more acorn items in the future. Shipping Is Half Off Each Additional Item Added To Multiple Item Orders.. Fashion, Classic, Trendy & Unique. Every set is one of a kind. Designed & handmade by the Mama Bear. 2 Strand with sterling & 24k gold plated findings. Made from lampworked glass beads, gemstone beads, ceramic beads, crystal beads and wood beads. Mixed legnths. Shipping is half off each additional item ordered after the first item. Custom pieces done at no extra charge. If you have any questions please feel free to email me at any time. Fashion, Classic, Unique & Trendy. For The Girls Who Like Big Pieces. Large Chunky Gemstone Beads. 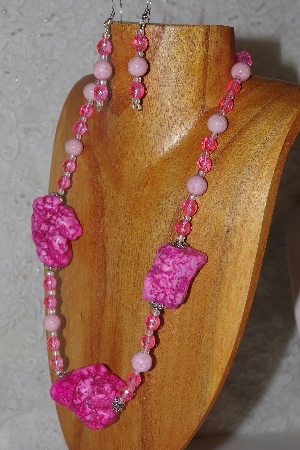 Mixed With Glass Pearls,Glass Beads, Crystal Beads & Gemstone Beads. All Designed & Hand Made By The Mama Bear. All One Of A Kind. Each Set Comes With A Necklace & Matching Earrings. Bead Necklaces: Unique Fancy "Hand Made Bead" Necklace & Earring Sets"
Fashion, Classic, Unique & Trendy. All these sets have very fancy hand made beads. There are "Victorian Rose Petal Beads". Hand made by the Mama Bear with roses grown by her. They have a slight natural rose scent to them. And are coated with a decopage sealer for shine. Homemade "Coffee Beads" made from fresh brewed coffee & coffee grounds by the Mama Bear, they have a slight coffee scent to them are are coated with decoupage sealer for shine. They look like gemstones. 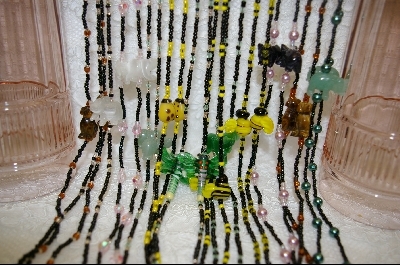 Also hand made fancy shapped beads covered with glass seed beads. Very unique beads, also made by the Mama Bear. 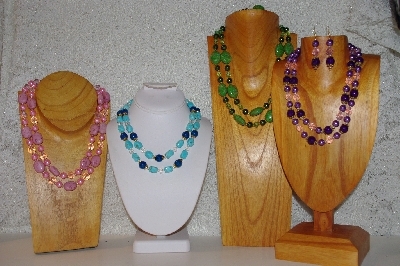 Each necklace & earring set have assorted lampworked glass beads, fancy glass beads, glass pearls, crystal beads & gemstone beads. They come with a very easy clasp & the earrings are all pierced. I can convert them to clip on's if requested. They come in Sterling, Sterling Plated & 14K Yellow gold plated findings. They are all custom made and one of a kind. Shipping is 1/2 off each addition item ordered after the first item. 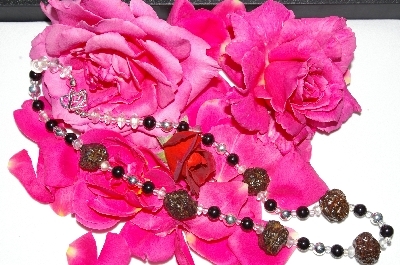 Bead Necklaces: Unique Hand Beaded Earrings & Necklaces"
Fashion, Classic, Trendy & Unique. The Products In This Section Are All Hand Made. Mostly By The Mama Bear. Sterling. Silvertone, Gold Plated, Goldtone, Base Metal & Copper Findings. Glass, Art Glass, Enamel, Crystals, Acrylic and Gemstone Beads. Enameled & Plain Conchos. A Very Large Varity. Custom Orders Are Excepted. Shipping & Handling Is Half Off After The First Item Ordered. Any Questions, Please Feel free To Email Me At Any Time. Fashion, Classic, Unique & Trendy. Hand Made By The Mama Bear. All One Of A Kind. Sterling, Sterling & 14K Gold Plated Findings. Made From Crystal,Art Glass, Glass Beads, Gemstones & Glass Pearls. Multi Colors. 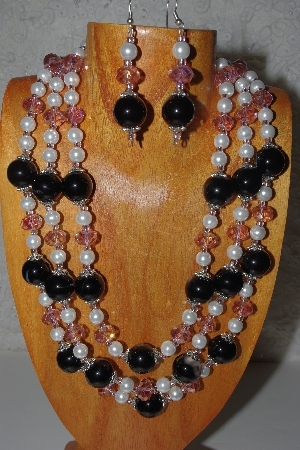 Necklace & Earring Sets. Measures 16 Inches & Up. Shipping Is Half Off After First Item Ordered. Any Questions Please Feel Free To Email Me. Fashion, Classic, Trendy & Unique. Every set is handmade & designed by the Mama Bear. 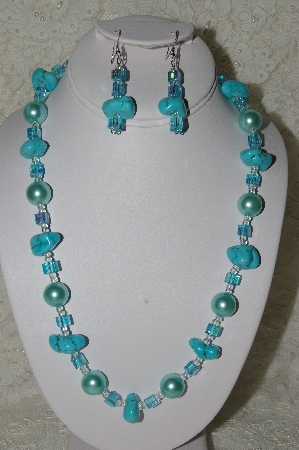 Each set cnntains a three strand necklace and a matching pair of earrings. Findings are 14K yellow gold & sterling plated. 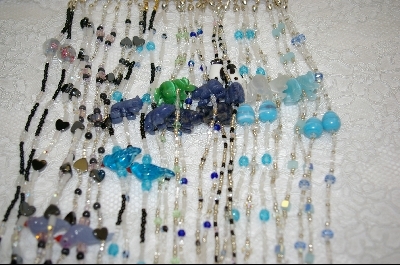 Products used are gemstone beads, acrylic beads, glass beads, wooden beads, mother of pearl shell pearls & glass pearls. Every set is hand made & one of a kind. Custom orders are welcome and at no extra charge. Shipping is 1/2 off after the first item ordered. If you have a questions please feel free to email me at anytime. Fashion, Unique, Classic & Trendy. Bling For Your Eye Glass's. All Are One Of A Kind. Designed & Hand Made by the Mama Bear. Eye Glass Holders With Matching Earrings. Materials Include Gold & Silver Plated Findings, Glass, Crystal & Gemstone Beads. Totally American Made.....Large Variety Of Colors. 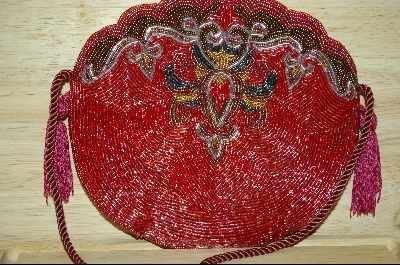 Shipping Is Half Off Each Additional Item Added To Mutable Item Orders..
Beautiful Selection Of Hand Beaded Purses & Belts. Many Colors. All The Belts Have Velcro Closures. Some Of The Purses Are Clutch Style & Some Have Shoulder Straps. On All Orders With More Than 1 Item, All Additional Items Are Half Off On Shipping. All Hand Made By The Mama Bear. Not From A Pattern Or Kit. Needle & Thread Work. 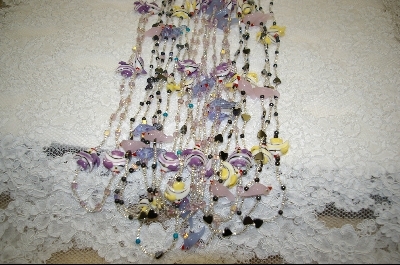 Made From Glass Seed Beads, Bugle Beads & Crystal Beads. One Of A Kind Sets. Opening Is 1-1/4" Wide And Fits All Sizes. They Measure 4-1/2" X 4-1/2". They Are 15 Years Old And Have Never Been Used. All Are In Excellent/Mint Condition. Will Also Take Custom Orders For More Colors. Have More Christmas Items In Collectible Section. Shipping Is Half Off Each Additional Item Added To Multiple Item Orders. If You Have Any Questions, Please Feel Free To Email Me At Any Time. 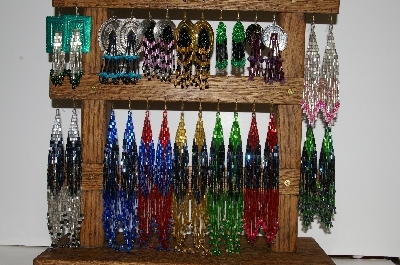 Fashion Eyeglass Holders "The Audacious Collection"
All Hand Made By The Mama Bear. Made From Hand Carved Gemstones, Gemstone Beads Of All Sizes & Shapes, Glass Beads Of All Sizes & Shapes, Lamp Work Glass Critters & Stuff and Glass Pearls. These Eyeglass Holders Have More Of Everything They Are A Little "Audacious & Flamboyant" On All Orders With More Than 1 Item, All Additional Items Will be Hlaf off Shipping Charges. Fashion Eyeglass Holders "The Black Collection"
Hand Made By The Mama Bear. Made From Hand Carved Gemstones, Glass Beads Of All Sizes & Shapes, Crystal Of All Sizes And Shapes, Gemstone Beads Of All Sizes & Shapes, Lamp Work Glass Beads & Critters and Glass Pearls. All Are "One Of A Kind" Custom Orders Available Upon Request. All Orders With More Than 1 Item, All Additional Items Will Be half Off Shipping Charges. 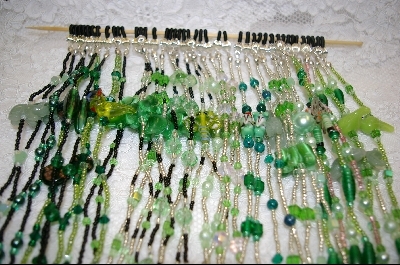 Fashion Eyeglass Holders "The Green Collection"
Tired of looking for your glasses? Why not just wear them in style. All Hand made By The Mama Bear. Gemstone Carved Animals, Glass Lamp Work Critters & Stuff, Crystal, Glass Beads & Pearls....The Green Collection! 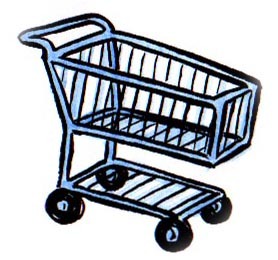 All are One of A Kind, All Orders Containing More Than 1 Item, Each Additional Item Will Be Half Off Shipping Charges. 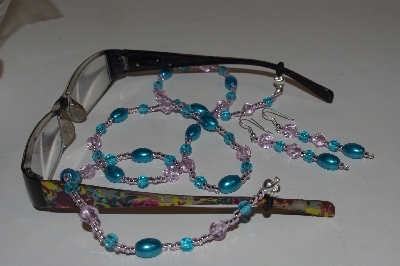 Fashion Eyeglass Holders "The Pink Collection"
All are made by the Mama Bear. Carved Gemstone Animals, Crystals, Glass Lamp Work Critters & Stuff,Glass Beads Of All Sizes & Shapes and Glass Pearls. The "Pink Collection" Is Truly For The Pink Lover. All Are One Of A Kind. All Orders With More Than 1 Item, All Additional Items Will be Half Off Shipping Charges. Fashion Eyeglass Holders "The Red Collection"
Hand Made By The Mama Bear. Made From Hand Carved Gemstones, Glass Beads of All Sizes And Shapes, Crystals Of All Sizes & Shapes, Glass Pearls, Gemstone Beads And Lamp Work Glass Critters & Stuff. All Are One "Of A Kind". Custom Eyeglass Holders Available Upon Request. All Orders Containing More Than 1 Item, Each Additional Item Will Be Half Off On The Shipping Charges. Fashion Eyeglass Holders "The Silver Collection"
Hand Made By The Mama Bear. Made From Hand Carved Gemstones, Glass beads Of All Sizes And Shapes, Crystals of All Sizes And Shapes, Gemstome Beads Of All Sizes And Shapes, Lamp Work Critters & Stuff And Glass Pearls. All Are "One Of A Kind" Custom Orders Available Upon Request. For All Orders Containing More Than 1 Item, All Additional Items Will Be Half Off Shipping Charges. Fashion Eye Glass Holders "The Yellow Collection"
These are not your grandmother's "Eyeglass Holders". All hand strung by the Mama Bear. 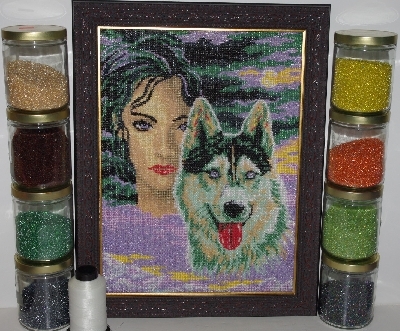 Made from Crystals, Seed Beads, Gemstone Animals, Lamp Work Whimsical Critters and Shapes and Glass Pearls. Can't keep track of your glasses? Wear them in style. Each one is "One Of A Kind". On All Orders With More Than 1 Item, All Additional Items Are Half Off On Shipping. 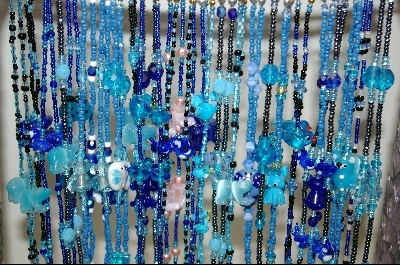 Fashion Eyeglass Holders "The Blue Collection"
All Hand Made By The Mama Bear. All Are 1 Of A Kind. Made From Hand Carved Gemstones, Crystals, Glass Beads, Lamp Work Critters & Stuff and Glass Pearls. A Very Classy Way To Wear Your Glasses. The Blue Collection. All Orders With More Than 1 Item, All Additional Items Will Be Half Off Shipping. 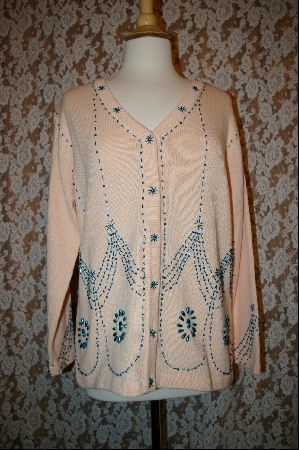 StoryBook Knits are Hand Loomed Sweaters. All are Limited Edition Sweaters. They Come In a Varity Of Beautiful Colors. They Come With A Variety Of Whimsical Designs. They Are Embelished With, Beads, Pearls,Embroidery, Specialty Trims, Unique Accents,Ribbing,Appliques,Satin Ribbon and Crochet Trim. They Are Made Of 55% Ramie & 45% Cotton And Are Hand Washable. I Have A Rather Large Collection Of Never Worn Sweaters. Most Are No Longer Avaliable. On All Orders With More Than 1 Item, Each Additional Item Is Half Off On Shipping. 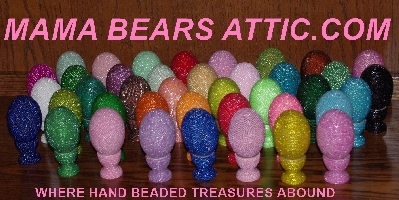 Large selection of 1 of a kind glass beaded eggs with matching egg cup stands. 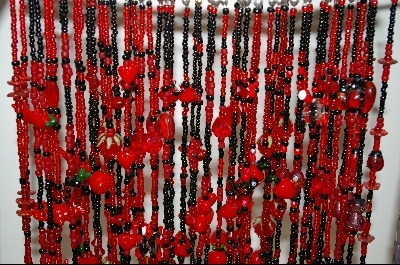 Vintage glass seed beads. All hand done. Each bead set individually. 7,000 to 10,000 beads per set. Each egg measures 2.3" X 1.6". Each egg cup measures 1.3" X 1'1". Solid wood. Clear coated in high gloss. Luster, Pearl, Metallic, Transparent, Opaque & Silver Lined Glass Beads. 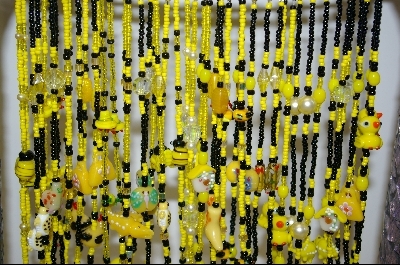 Beads from the 1980's & 1990's. 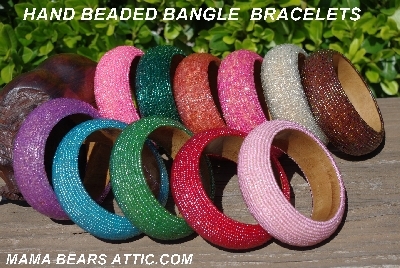 Each color of bead comes in multiple shades. Shipping is full price for 1 and 1/2 off each additional set per order. I will sign & date the bottom of each egg cup if requested as these are my creations and that each one is one of a kind. 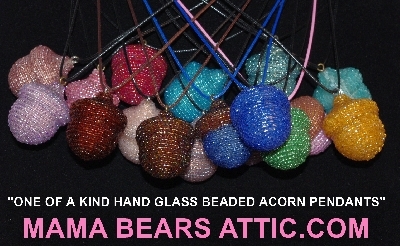 Hand Glass Beaded Acorn Pendants"
Acorns Represent Good Luck & Spiritual Growth. All Are One Of A Kind. Hand Glass Beaded Acorn Pendants With 18" Cord Necklace. Beads Are All Hand Set 1 At A Time. 18" Waxed Cords With Lobster Claw Clasps. 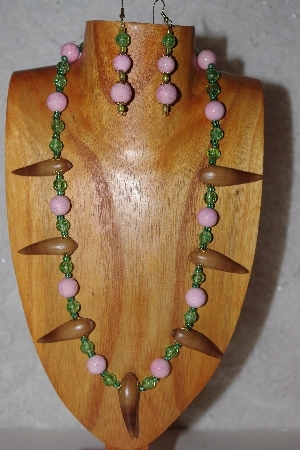 Vintage 1980's Glass Seed Beads. Clear Coated 3 Times To Protect Bead Work. Very Unique Pieces. The Egg Is A Symbol Of Un-Hatched Potential, Hope, Purity, Luck & Wealth. Each Pendant Is One Of A Kind. All Hand Set With Vintage Glass Seed Beads. Each Come With An 18" Waxed Cord Necklace With A Lobster Class Clasp. Each Egg Measures 1-5/6" X 1". 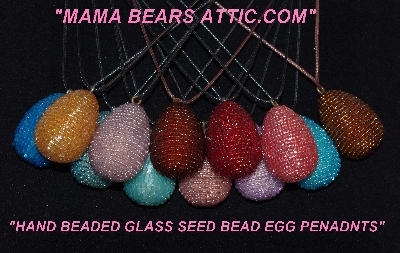 Each Egg Is Clear Coated 3 Times To Protect Bead Work. Very Unique Pieces. This is my personal collection of tapestry's. I started beading them in the early 1980's. Although they were meant to be embroidered with embroidery thread I decided to take it a step further. These are the finest French tapestry's money can buy. They are all unique works of art. All are 1 of a kind. 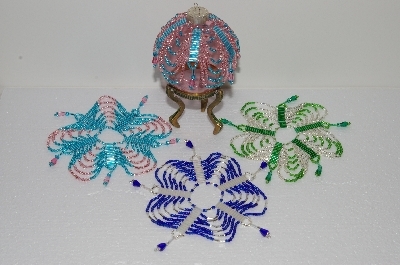 Each is hand beaded with glass seed beads. 100's of hours go into each piece. 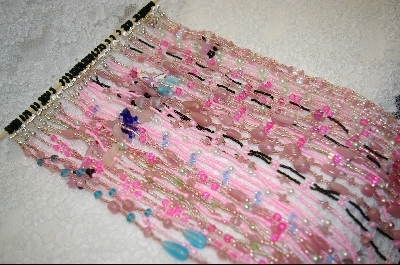 Each bead is sewn on one at time & is very time consuming. They are professionally framed. I have signed the back with year, bead count and my signature. Some come with info on metal tags on the front bottom. Each is unique & more beautiful in person. While I have many pieces that are framed I also have some that you can choose the frame for. They are all signed, dated & with bead count. A Mama Bears Attic Original. All One Of A Kind. All Hand Made. Solid Natural Wood. Glass Beads Of Various Sizes From The 1980's & 1990's. All Hand Set One Bead At A Time. 3 Coats Clear Gloss Sealer. 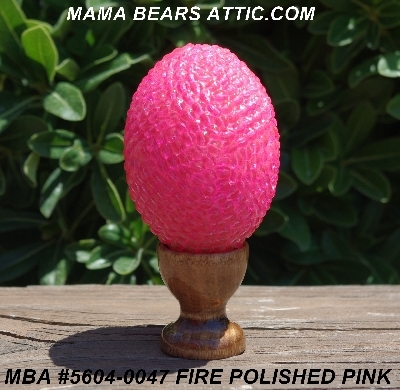 Hand Stained & Sealed Egg Holder. Large Variety Of Colors.